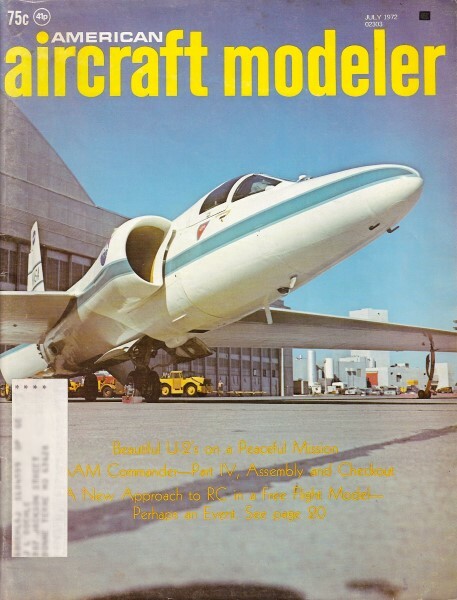 This article on radio-controlled free flight was scanned from the July 1972 edition of American Aircraft Modeler. It generated a lot of unfriendly letters to the editor from free flight purists. Such letters, published in the reader feedback section, were much less polite than those you would see today. Radio-Controlled Competition FF Gas Models are a Challenge and Possibly a New Event. There is No Modeling Activity Quite Like It! AAM Editor Ed Sweeney after consultation with Frank Ething of AMA who is also working with a 15-sec. limit on motor run. The plane would have to land near the original launch point for a flight to be counted. A flight over six minutes would be voided. The motor run would be timer-actuated rather than radio-controlled and a limit of two channels would be imposed on the RC equipment. The airplane would be 15 powered. Problem of adapting to rudder and elevator control without adding lots of weight was solved simply. It's easy to build, and reliable. The Fortune Hunter sports a hot GMA 15 motor, Cherny-Van Nest pan, and pen bladder pressure fuel system. Hatch covers RC compartment. Switches for on/off and frequency. The author traveled over 9000 miles to FF contests in 1971, and considers himself a FFer even with RC gear in his ship. Wife Mary-Kay operates starter. Author with model. Lettering on MonoKote was done by Tom Peadon using bulletin enamel. Two-channel RC units are now available from several manufacturers for $100 to $120; less in kit form. These units weigh eight to ten oz. for the airborne components and generally combine receiver and servos in one compact package, or brick. They are highly developed and pose no problem for one who has never used radio equipment, which was my case. The same goes for the other RC hardware such as pushrods, connectors, and control horns. The idea behind the first ship was that it should be like current contest FFs so it could be trimmed safely without RC to fly on its own. This proved to be wise: the model was saved from destruction by the built-in stability of the design. However, after getting used to controlling the model, FF trim has been increasingly ignored and the model is now controlled during much of its flight to improve duration. A typical flight sequence goes like this: set engine run timer, turn on switches and check controls; start engine and check controls again; launch model (throw hard straight up) while helper holds transmitter; take transmitter and feed in up control to steeper climb angle to about 80 degrees, while applying slight rudder corrections to keep model going straight into wind. As your helper counts off seconds 12-13-14, apply gradual left rudder and back off up control to establish a left banking arc for insertion into glide; as motor quits, apply more left rudder and correct stall tendency with down elevator; continue left glide turn until model points into wind. Relax controls and trim for slow glide with elevator trim button (model is trimmed to glide moderately fast and straight without controls). If lift is encountered, circle in it as long as ship does not get too far downwind; if in bad air, flyaway from it in search of better conditions. As five minute max approaches, bring the ship back to launch point with faster glide trim; once it is overhead, circle or do 5 turns until time to land. To land, make downwind turn and float in upwind. Or, dethermalize model with full up control. It really sounds quite simple, but it's one thing to describe and another thing to actually do. In 15 seconds this design is a small speck in the sky - it must hit 80 mph at the top. To make the longest possible flight, you have to be very careful not to make mistakes in controls - like stalls, turning too tightly, or gliding too fast. On a perfect still-air flight the Fortune Hunter does nearly five minutes. However, a botched power/ glide transition or a few stalls decrease duration significantly, as in pure FF. Fortune Hunter specifications are as follows: wing area is 600 sq. in. ; power is a GMA 15 on high nitro fuel and Rev-Up 7½-3½ propeller; weight is 32 oz. The covering is MonoKote and airfoils are conventional flat-bottomed ten percent thick; CG falls at about 80 percent. The control system is shown in an accompanying illustration. The engine run is regulated by a Tatone pinch-off timer. The fuel tank is a high pressure pen bladder. There are no warps except for ½ in. wash-in (trailing edge down) on the left main wing panel. The second generation competition RC FF will probably not be merely a hot FF adopted to RC. Most experts I've talked to think the best future designs will be too unstable to be easily trimmed for FF, due to the need for less dihedral to make control during the climb easier. One of the worst defects of the Fortune Hunter is its tendency to overreact violently to one side when more than slight rudder control is given. Ron St. Jean of California is also working on RC FF and experienced the same problem with his first attempt. He used his famous Wizard 700 with a K&B greenhead 19. It was modified with a larger rudder and larger fuselage and slightly less dihedral, but it still was almost uncontrollable under power due to excessive pendulum effect of the high pylon combined with normal dihedral. Adding rudder area did not help, according to Ron, so he removed more dihedral. I also added about 30 percent more rudder area after initial flights, but I have not experienced extreme difficulty because the Fortune Hunter's pylon is rather low and the high thrust line design inherently flies a groovier pattern. Future designs will reflect the need for less built-in stability-they witl probably be shoulder-winged with low dihedral, as shown in the drawing. Another problem is wind penetration. Both Ron's ship and my own are fairly large for their weight and are limited in their ability to make progress against strong winds, which is necessary in order to range far from the launch point in search of thermals. Future designs will thus be smaller and more streamlined. The drawing of the Fortune Hunter control system shows how dethermalizing capability is incorporated. While it may not be necessary in the future, it is nice to have the dethermalizer when an emergency situation occurs and have the ship correct itself and float safely to the ground. In this regard, a safety catch on the transmitter is a good idea to prevent the dethermalizer from being actuated accidentally. One exciting prospect for free flighters is that RC FF will interest the RC manufacturers. This will mean more FF hardware, engines and research, which is bound to benefit normal FF activity as well, since many of the components will be interchangeable between pure and RC FF. Undoubtedly RC FF has all the appeal needed to become very popular. It should draw fliers from all ranks, including present RC fliers who recognize fun and a challenge when they see it. FF'ers who try it will be rewarded with the knowledge that their sport has a new lease on life. Rules to govern future competition should be kept simple and they should emphasize duration as the deciding variable. In other words, no bonus points awarded for spot landing, stunts, etc. The problem of already crowded frequencies in RC is undeniable. It is intended that RC FF will use the 27.255 MHz spot frequency. This channel is not normally useable for RC due to interference, hand-held transmitters, certain FCC limitations, etc. However, a new concept which provides as many as 32 commands on one frequency may provide a solution and thus completely avoid interfering with present RC channels. It ;s also a license-free channel. The radio system requirement that later rules will specify will describe the physical size, weight, frequency and channel operation, and permit only two operating functions. Any manufacturer can produce the airborne unit for the activity, meeting only these requirements. How each manufacturer achieves the requirements will be up to him. Cost of the airborne unit will be low but the transmitter will probably be club-operated. Several FF kits could be converted to two-channel RC with extensive modifications required only on the fuselage. The Starduster 900 and 600, the Galaxy 585, the Witch Doctor 800, and the ABC Scrambler are the most likely choices. A safe way to go about converting all of these designs would be to first reduce the dihedral angles by 50 percent and lower pylon height by 75 percent. Rudder area of the Stardusters should be doubled. The Witch Doctor and ABC Scrambler should have about 50 percent more rudder area. The rudder of the Galaxy 585 should be moved aft of the stab and doubled in area. In all cases, the fuselage would have to be widened to accommodate the receiver and batteries. A one- or two-inch nose extension will be required to retain CG location with the added tail weight of the pushrods and control horns. The Fortune Hunter control system should work fine on all of the above designs, and the rudder flap area should be retained at about 2 to 3 sq. in. The Starduster 900 might even put a ! few 12-foot RC sailplanes in the shade when it comes to sheer glide.